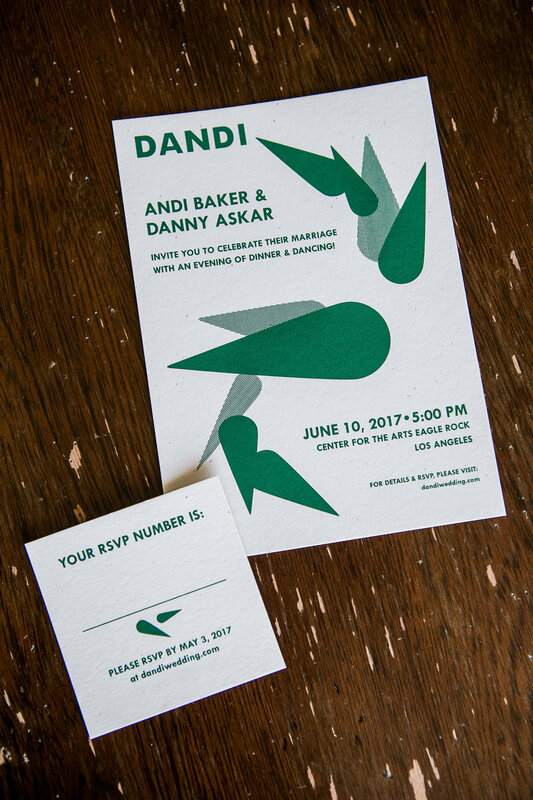 With Danny being a fine art screenprinter, it was only natural that he printed our wedding invites. Danny is also a very talented graphic designer - double win. We first thought that we would only be screen printing the invites, but then it turned into menus, place cards, seating charts, and more. Designing (I got to play art director) and printing everything for our wedding was really fun and rewarding, but a lot of work. And we did it... twice. Since we decided to have a small, intimate wedding in Big Sur and then a larger party in Los Angeles, we had two different visions for our designs. I was so excited to see what we would come up with and to be his right-hand-lady in the process! For the Big Sur invite, we went for a forest-y, landscape theme to get our guests excited for the adventure ahead. For the party, we re-mixed/re-purposed an existing design from the 1960s. 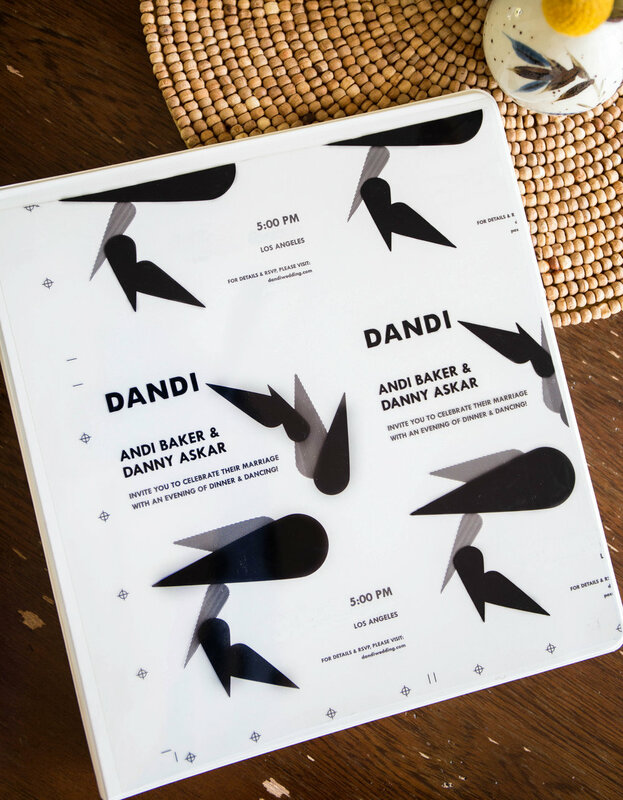 This design was originally used on the cover of a piano song book of the Kink's "Dandy", which we also had Danny's grandma perform at our wedding with her own lyrics written just for us. The photos here show this invite in particular being printed. I was lucky enough that Danny could print them on a day that I wasn't in the office, so I was able to photograph him work. I guess you could say green was our wedding color. I had originally wanted a shimmery copper, but we decided that green would be more versatile and less exhausting throughout the series of pieces. Danny mixes all of his inks from scratch to ensure the perfect color, which is a very tedious process. This was probably the longest part of the day besides waiting for them to dry. It was so cool to see our creation come to life on paper and see my then future-husband in his zone working on a personal project! We really felt like this special, DIY touch really set the tone for our entire wedding. I couldn't have asked for anything more beautiful. 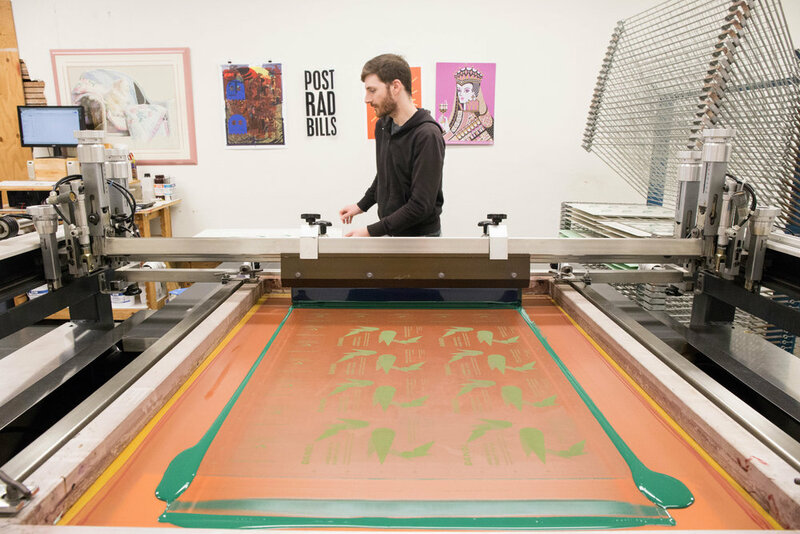 Danny is LA's best screen printer. I know that sounds biased because I am now married to him, but he really is. His superior organization, clean workflow, and ultra-tight registration make him stand out from the rest. Thank you, Danny. I love you. Photography by Even Keel Imagery & myself. Now that we are only a few weeks out, my one word of advice to newly engaged DIY wedding planning couples: ORGANIZATION! Danny and I got engaged on May 22, 2016 and we couldn't have been happier. I mean, we've been attached at the hip since 2011. Getting engaged is exciting. It's a party. It's an important life chapter. It's cloud nine. Then, there's the wedding planning. The first thing we did was to sit down and write out lists of our must-haves. We both knew from the get-go that we wanted to make it very personal, to really describe us as a couple, and to steer from the typical cookie-cutter-foo-foo type of wedding (I highly recommend this step because it will help narrow down location, venue, and vendors tremendously). As a kid, I always envisioned some large wedding, but as I got older, I realized that I'm not much for crowds, especially when the attention is on me. Luckily, Danny felt the same, and we decided to have a small wedding. "Great, this will make it easy!" I thought. Yeah... not really. My fiancé happens to come from a v large family, and mine is quite small by comparison. So, we compromised and decided to plan a small, intimate, destination wedding, and then a larger family party after. One thing we didn't fully realize at the time was that we had just signed up to plan two weddings. Two florists, two caterers, two everything. WTF. We instantly became overwhelmed. Full-on wedding coordinators are very expensive and were out of the question, so we took the planning into our own hands. It was crucial to stay organized from day one. It's really easy to lose track of all the moving parts that make up a DIY wedding, so we knew we needed to rely on all of the tools a resources we could get our hands on. First, I went to Target and picked up this cute accordion file which had plenty of tabs to hold all of our contracts and vendor info. It seemed practical at the time, but as it began to fill up and things become more detailed, the file became more difficult to work with. The novelty wore off and I realized I needed to re-evaluate. Plan B: a binder. I picked up a good ol' white Avery binder, some white tabs, and got to work. Since our wedding is mostly DIY, I thought it would be cute to use the transparency film from one of our invite designs (more to come on that later!) to insert into the view pockets. This made it personal without being too wedding-y. I then divided the binder into two parts: "Ceremony" and "Party", and then organized each corresponding vendor's contracts, menus, copies of payment, floor plans, and emails. Ah, instant wedding organization! The binder was a winner! Just make sure to have a 3-hole punch ready, because the need for binder holes may be the only downside to this solution over an accordion binder, which does make page drop-ins quicker. Lastly, if you're like Danny and I, you believe that paper documents are out (hey, it's 2017!) and are super into sharing Google Docs! This is another great tool for organizing the constantly changing things like to-do lists, guest lists and RSVPs, and is literally accessible anywhere at anytime. I also recommend having a shared Google Calendar for assigning deadlines and wedding related appointments (time will fly!) There are also apps that can help you stay on track, such as Wonderlist or Evernote, where you can share running to-do lists if spreadsheets aren't your thing. Organization takes time in the beginning. But it will save you a ton of headaches as you get closer to the end of your planning, when details are becoming crucial.